Project Overload is happening right now. It is a daily video series you can find it on all the links below on youtube, reverbnation, twitter, facebook and drooble. Harry Pyle is a musician from the capital region of New York. It's mostly instrumental music that ranges from electronic dance music to rock and metal, just about anything goes. 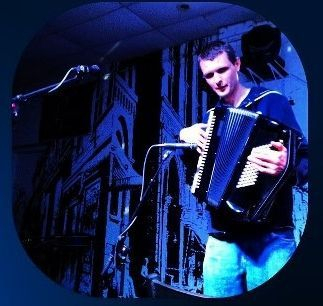 Live performances are done with pre-recorded drum, bass, guitar and synth tracks and most often plays an accordion live. Switching between accordion, keys, guitar, and bass in longer sets is also common. The amount of original songs number in the hundreds, so each live performance is different each time. "Creating a sound that belongs in the background of a computer game on acid, shot in the face, and eaten by wolves, Harry's music bordered self-irony and we were immediately captivated." "It takes a while, but every so often I come across something that is really different, completely unique, and stands out above the rest. That’s the first thing I think of when I listen to the musical creations of Harry Pyle."